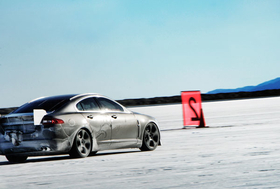 DETROIT -- Jaguar is expanding the XF range for the 2010 model year with the addition of the high-performance XFR. The lower-premium car is powered by a supercharged 510hp version of Jaguar's new 5.0-liter direct-injection V-8. That power is routed through a six-speed automatic transmission. Jaguar says the XFR goes on sale this spring. On the road, the XFR goes from 0 to 100kph in 4.7 seconds, Jaguar says, and top speed is electronically limited to 250kph. The car can go a lot faster. In November, a slightly modified XFR with the 5.0-liter engine became the fastest Jaguar ever. The car was pushed to 364kph during a test run at the Bonneville Salt Flats in the U.S. state of Utah. The previous record was 349kph, which was set in 1992 by an XJ220. To make the record-setting XFR even faster, Jaguar engineers made modifications to improve its aerodynamics at high speeds. "We lowered the ride height and put a big spoiler on the back to keep the car on the ground," said Jaguar Programs Director Mick Mohan. "We removed the catalysts, put in racing fuel and made a slight change to the supercharger pulley -- but all the internals were absolutely standard." Launched alongside the XFR at the show were coupe and convertible versions of the XK upper-premium model. Both cars are powered by the same 510hp engine that is in the XFR.